Fun fact for the day: The human eye can distinguish between 2.5 million and 10 MILLION color variations. Combine this with hundreds of marketing messages we see per day and your task for choosing the layout/design for your next product instantly became a bit more daunting. That is if you are interested in using color psychology well. Too many times decisions are made based on “What looks good” when the better question should be “What feels right?” Results from studies like The Interactive Effects of Colors show that the relationship between brands and color hinged on the perceived appropriateness of the color being associated with the particular brand. Basically does the color “fit” what is being sold? 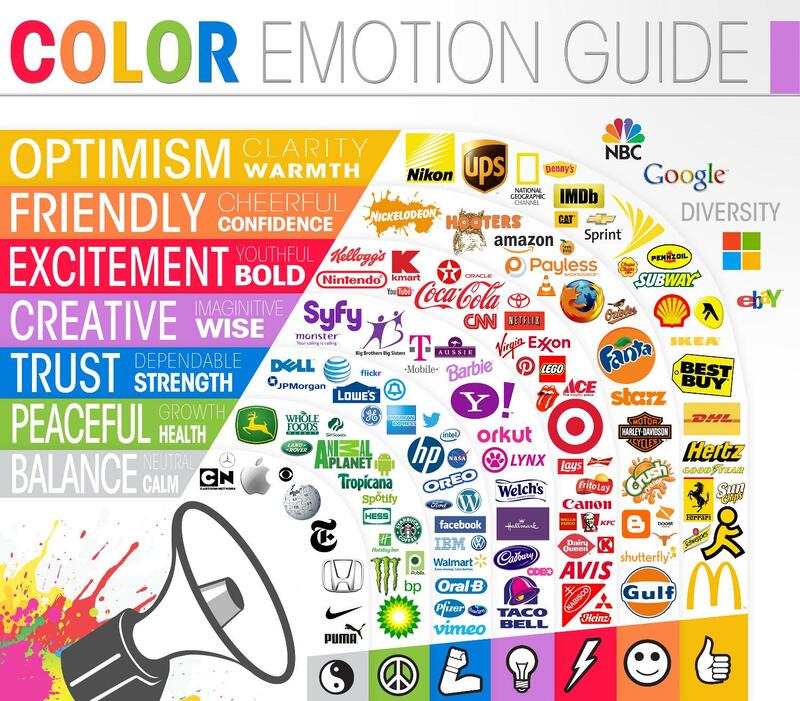 Color increases brand recognition by 80% so pay close attention to these color psychology infographics we found. Blue typically associated with feelings of trust, security, confidence and intelligence. It is considered a strong masculine color and is effective in portraying intelligence and cleanliness. It produces calm feelings and is recommended for more organizations concerned with creating a professional image. Green can either represent wealth and finance (dark green) or entertainment and leisure (light green). Either way green symbolizes growth, harmony and fresh qualities. Dark green invokes feelings of health as well as financial security or success. It is the easiest color for the eyes to look at and even improves vision. We suggest using this when representing testimonials and founder’s stories. Red actually increases your heart rate by activating the pituitary gland. Use this when conveying excitement or extreme emotions. Food companies use red in store signage because it encourages appetite and enhances metabolism. A recent study found that changing the color of the price from black to red in an advertisement makes men think they are getting a bargain. Because red is highly visible and helps bring text and images to the foreground, we suggest using it as an accent on your signage to attract attention to your key messages. Yellow is associated with joy, happiness, optimism and energy. This color stimulates mental activity and generates muscle energy. Use yellow sparingly as a way to get attention or to contrast with another color. Orange is enthusiastic and cheerful, a combination of red and yellow attributes. While still grabbing a consumer’s attention, orange is more toned down. Many people respond physically to the color with increased oxygen to the brain, invigoration and mental stimulation. Our suggestion? Use orange to convey excitement and strength without overbearing the consumer. Black can be powerful, dramatic, classy or protective. You see black often used when advertising a timeless product or to really round a company’s. Typically we see black on expensive products like clothing and technology. White on the other hand exudes simplicity and purity. It can be used to help build a brand’s goodness and innocence. White is often used with health related products. So next time you need to update your advertising, signage or logo, do not open the nearest box of crayons and pull out a handful to choose from. Within every industry there are color trends. Look at what your competitors are doing and find a way to differentiate yourself. Don’t use color for color’s sake. In an article entitled Impact of Color Marketing, researchers found that up to 90% of snap judgments made about products can be based on color alone (depending on the product). If you have to choose between color psychology theory and market trends, be critical. It is more important the colors support the personality you want to portray instead of trying to align with stereotypical color associations. If you need help designing your franchises logo, marketing material or product displays let us know, we’d love to help. That’s really cool that orange can make some people have more mental stimulation, more invigoration, and more oxygen going to their brains. 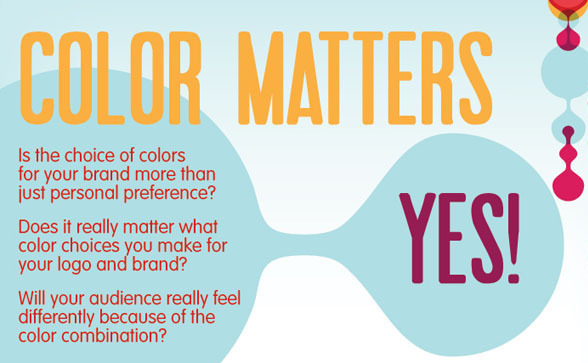 I’d think that color psychology would be especially good for new businesses to get behind. Using this they could pick office colors that make their employees work harder and feel happier.